"MEMS: Green pressure sensors tap QMEMS"
Taking accurate measurements of water levels in rivers and in industrial settings requires sensors that used to contain hazardous oil or gases that could cause pollution. Now Epson Toyocom has harnessed its quartz micro-electro-mechanical (QMEMS) technology to take green fluid pressure measurements while operating under stringent cleanliness requirements. R.C.J. Pressure sensors got greener recently when Epson Toyocom (El Segundo, Calif.) announced a quartz microelectromechanical system (QMEMS) technology that eliminates the hazardous oils and gases used in most high-precision pressure sensors. 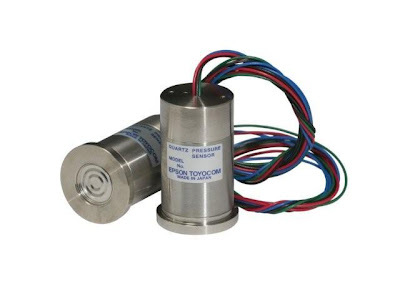 High-precision pressure sensors today contain a pressure-transmitting medium, such as oil, that has the potential of leaking into the environment, an Epson Toyocom spokesperson said. The company's approach instead measures pressure with a frequency-stable QMEMS tuning fork as the pressure-sensing element. As pressure changes against the sensing element, the pressure-transmitting architecture directly reads out pressure without the risk that oil or hazardous gases will leach into the environment, the spokesperson said. The first model of the new architecture, the XP-7000, can directly measure pressure with an accuracy of ±0.05 percent. The QMEMS sensor is also 40 percent smaller than other, similar pressure sensors, according to Epson Toyocom. "ALGORITHMS: Sharc DSP helps pack audio recording studio into a laptop"
Analog audio effects still rule in professional audio production, but don't fit well with the digital recording technologies. Universal Audio solved that problem several years ago by creating algorithm-based analog effects that mimic the old-school analog equipment that is not even being manufactured anymore. Unfortunately, these computationally intensive algorithms require an Analog Device's Sharc digital signal processor (DSP) that was until now only available for computers with a PCI bus. 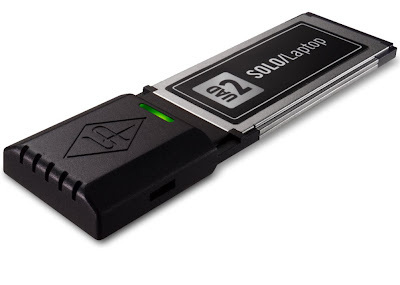 Now Universal Audio has shoehorned an ADI Sharc onto an ExpressCard that fits into laptop computers, enabling UA's 30,000 users to mix tracks anywhere. R.C.J. An audio recording studio has been packed into a laptop computer card by harnessing Analog Devices' Sharc floating-point digital signal processor (DSP). 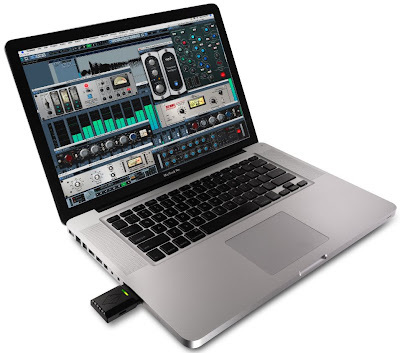 Universal Audio's Solo ExpressCard for Mac or PC laptops is intended to unshackle professional recording engineers and producers from the studio, enabling them to mix audio tracks anywhere. The card can mix and master at sample rates from 44.1 to 192 kHz while emulating analog effects from vintage devices made by such companies as Moog, Neve, Roland and SPL. Along with the Sharc floating-point DSP, the card packs a Xilinx FPGA, SRAM, flash and glue logic in a format measuring about 25 x 100 millimeters. The Solo does stick out slightly from a laptop's ExpressCard slot but is small enough to be tucked in a pocket when not in use, according to beta-tester Elliot Mazer who has done mix-downs for such artists as Pink, Switchfoot, Santana, The Who and Neil Young. "NANOTECH: Electronic nose sniffs out cancer"
Cancer can often be cured today if caught early enough. Unfortunately, people have to wait until symptoms appear before their doctor can pinpoint the specific test to be performed. Now researchers say they are on the trail of a new approach that can routinely screen your blood for any type of cancer--an electronic nose. Look for a blood test based on their work within five years. R.C.J. Anecdotal evidence that dogs can detect cancer by smell inspired researchers to combine clever chemistry with optical detectors to craft an electronic nose that they claim can not only screen for any kind of cancer, but also determine whether it is aggressive. A University of Massachusetts chemist and veterinarian collaborated with a Georgia Tech biochemist and materials specialist to craft the laboratory detection system, which they hope to develop into a universal blood test for cancer. 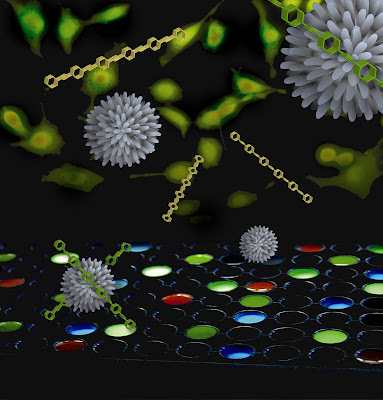 Like the red, green and blue pixels that mix to represent any color, three different kinds of nanoparticles can mix to cover the whole spectrum of cancer cells, the researchers found. The fluorescent nanoparticles are mixed with blood or tissue samples, where they bind to suspicious cells and, depending on the combination of particles that light up, indicate whether the cells are metastatic (capable of spreading beyond the initial tumor site). Carbon will succeed silicon as the predominate semiconducting material for the integrated circuits of the future. Today printable nanotube inks are enabling flexible carbon transistors that outperform organic transistors by 10-times, with standard chip technology switching to carbon as the base material within 10 years. R.C.J. Carbon--the basis of all organic compounds--appears destined to supplant silicon as the material of choice for future semiconductors. Carbon nanotubes, graphene and diamond films based on carbon--which sits just above silicon on the Periodic Table--can surpass silicon's abilities in thermal performance, frequency range and perhaps even superconductivity. Three-dimensional carbon--diamond--offers 10 times the heat dissipation of silicon, according to suppliers currently hawking 40-nanometer to 15-micron diamond films on silicon wafers. Two-dimensional carbon--3-angstrom-thick monolayers called graphene--could dismantle silicon's roadblock to terahertz performance by attaining 10 times the electron mobility of silicon. "One billion sold!" No, not hamburgers, but chips from Freescale's sensor unit which it inherited from Motorola's micro-electro-mechanical system (MEMS) group. It took 30 years to reach one billion, but as with hamburgers, the accelerated pace of sensor sales sold half of those units in the last few years. Look for Freescale to sell its second billion sensors within three years. R.C.J. 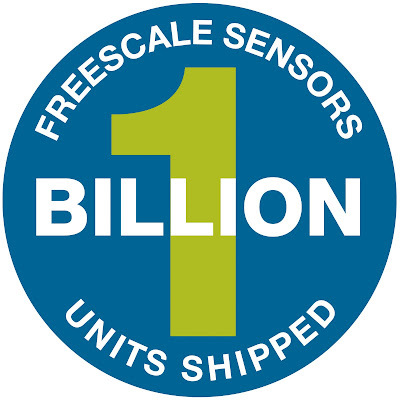 Freescale Semiconductor Monday (June 22) claimed its billionth sensor shipped at the IEEE's Transducers 2009 conference in Denver. Freescale's micro-electro-mechanical systems (MEMs) unit, which was originally part of Motorola, has a 30-year history in sensors and is currently No. 1 in automotive sensors, according to market research firm iSuppli Corp. To integrate its current line of MEMs chips and capacitive proximity sensors, Freescale (Austin, Texas) announced a Sensor Toolbox download that offers a common development software environment for designing with its sensors. "MATERIALS: "Graphene said to outperform copper interconnects"
Carbon based materials can transport signals better than metals at nanoscale sizes. Look for high-performance interconnection technologies to use two-dimensional nanoribbons called graphene to best metals in the next five years. R.C.J. Pure carbon interconnects, cast as tiny ribbons of graphene, will outperform copper interconnects below 30 nanometer line widths, according to researchers at the Georgia Institute of Technology (Georgia Tech). The researchers characterized graphene interconnection lines as small as 18 nanometers wide and found that they perform as well or better than even the most optimistic estimates of how copper interconnects will perform at those sizes. Unlike copper, whose resistivity goes up at these fine line sizes— due to scattering at grain boundaries and side walls—graphene's conductivity is enhanced by quantum effects at nanoscale sizes. "SPACE: IBM to forecast 'weather' from solar storms"
Weather in space is usually pretty uneventful, but soon the Sun is expected to change that by entering a violent period where solar plumes will eject plasma clouds which cause magnetic storms here on Earth. By anticipating such disruptions, space weather forecasts will mitigate the damaging effects of these storms in the coming months. R.C.J. Space weather forecasts predicting communications disruptions caused by sun-spots will begin later this month by IBM, Uppsala University (Sweden) and the Swedish Institute of Space Physics computing. 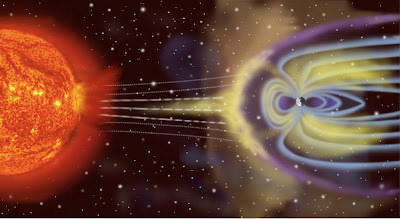 By integrating the signals from geographically dispersed 3D radio antennas, clusters of blades will issue space weather forecasts for the next 18-to-24 hours from the recent state of the Sun. This space weather forecasting capability is aimed at mitigating interference from Sun-spot Cycle 24—an 11-year cycle slated to begin this year. Sun-spot Cycle 24 is expected to disrupt satellite and terrestrial communications here on Earth as well as some landline communications and even the power grid. Early warning is theoretically possible, but the data processing task is enormous, since over 6 Gbytes of data needs to be sifted every second. "SPACE: Water Widespread on Mars, Just Dicovered by Now Dry Lake-bed"
NASA has discovered a long, deep canyon and the remains of beaches which it claims is the clearest evidence yet of a widespread standing water on the surface of Mars. The large lake apparently contained liquid water when the planet was supposed to have already dried up. A warmer period must have existed when the atmosphere was thick enough to allow open water--all conditions needed to support life. "MATERIALS: Graphene leapfrogs silicon with electrically tunable bandgap"
Carbon transistors are not only faster than today's, but now can have the bandgap which defines their semiconductor properties electrically tuned. 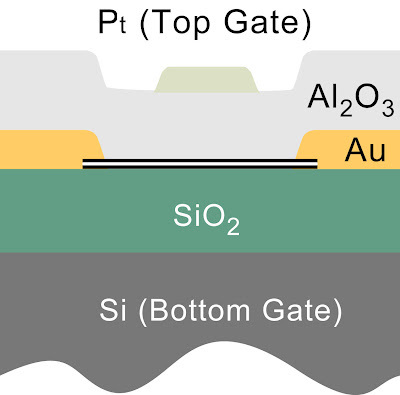 This unique new capability will likely propel carbon transistors past silicon within five years. R.C.J. Graphene--a two-dimensional sheet of carbon--holds the promise of 10-times faster speed than silicon chips, but until now were thought to require channels less than 10-nanometers wide in order to open up a bandgap suitable for digital circuitry, delaying its entry into the International Technology Roadmap for Semiconductors to beyond 2017, when sub-10 nanometer lithography becomes available. Now professor Feng Wang at UC Berkeley claims to have demonstrated a technology that can electrically tune graphene's bandgap, enabling it to be used for digital transistors long before lithography hits sub-10 nanometer sizes. "CHIPS: Terahertz SiGe imager sees through clothes"
Terahertz imagers can see through clothing and inside suitcases to spot weapons without the danger associated with traditional x-rays. They will also aid in navigation by pentrating storm or dust-cloud conditions, as well as enable enormous amounts of data to be transferred over secure line-of-sight connections. 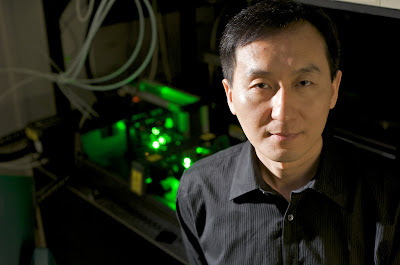 Look for silicon-based terahertz imaging chips by 2011. R.C.J. 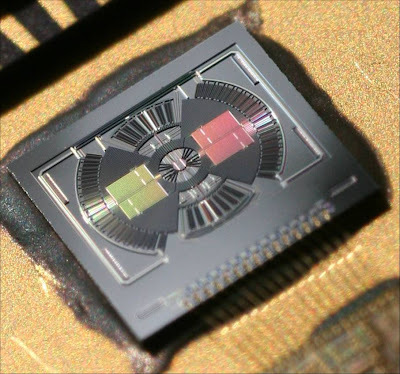 Silicon-germanium (SiGe) RF chips now in lab prototype form could one day be used in millimeter-wavelength W-band imaging devices sensitive enough to "see" through clothing to reveal concealed weapons. EEs from the University of California at San Diego (UCSD) presented their design at the IEEE RFIC Symposium in Boston on June 9. The chip operates in the terahertz range (1 THz = 1,000 GHz) to provide X-ray-like vision, but using safe, naturally occurring millimeter wavelengths. 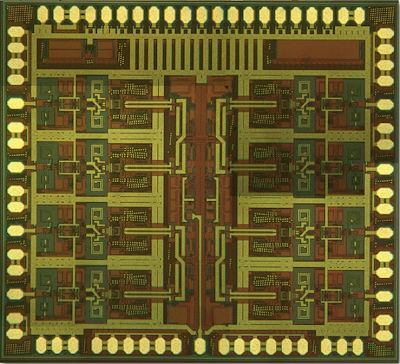 The designers said the chip could be produced using inexpensive silicon processing techniques. 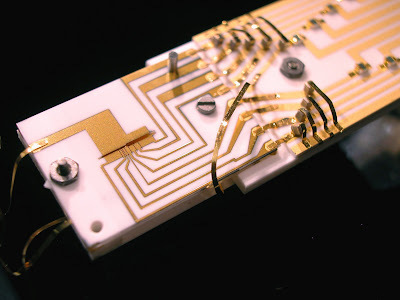 "MEMS: Silicon Clocks raises $10.3M to commercialize CMOS+MEMS"
Micro-electro-mechanical system (MEMS) timing devices can now be fabricated atop a customer's existing CMOS chip to eliminate the need for separate quartz crystals, according to Silicon Clocks. The company is already licensing its technology to CMOS chip makers so they can add timing capabilities to their own designs, and now it has Silicon Labs--the analog chip experts--to market the technology worldwide. 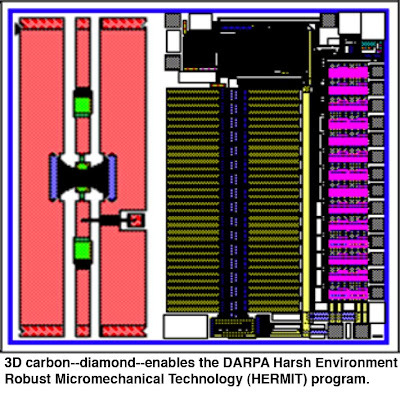 Look for C-MEMS chips from various vendors by 2010. R.C.J. Silicon Clocks Inc., a Fremont, Calif., fabless vendor of microelectromechanical system (MEMS) timing chips, has landed $10.3 million in a Series C financing round led by new investor Silicon Labs (Austin, Texas) joined previous investors Charles River Ventures, Formative Ventures, Lux Capital and Tallwood Venture Capital. Silicon Clocks' will use the money to ramp up production of its J-Series phase-locked loop technology, which produces low-jitter oscillators in the 100- to 700-MHz range using a proprietary CMEMS (CMOS + MEMS) process. "MEMS: world's thinnest accelerometer slims consumer gear"
MEMS accelerometers can add interactive features to consumer devices, such as automatic shifting from portrait to landscape mode as well as scrolling by tilting the display. Smart phones, GPS devices, laptop computers and game controllers are among the consumer devices now packing MEMS sensors, which are also being designed into a widening array of medical and scientific equipment. 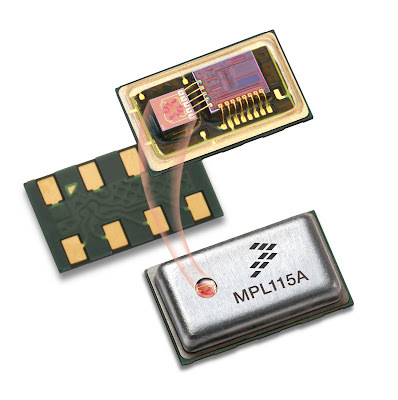 Ever slimmer accelerometer chip form factors are encouraging ever slimmer consumer devices, today and going forward. R.C.J. STMicroelectronics has fielded a 0.75-mm-thick three-axis microlectromechanical system (MEMS)-based accelerometer that it says will let even ultrathin consumer platforms offer advanced user interface features. 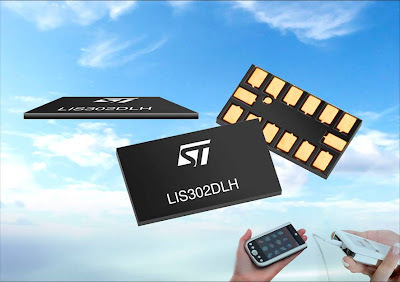 The LIS302DLH is the thinnest member of ST's Piccolo family of ultrasmall 16-bit MEMS chips, which are housed in 3 x 5-mm packages. ST said its digital three-axis accelerometer offers built-in motion sensing, orientation awareness, freefall detection and vibration monitoring. The device has a power-saving shutdown mode that awakens it automatically when motion is sensed. Acceleration measurements range from +8 to –8 g's. The LIS302DLH uses an SPI serial interface. "MEMS: gyroscopes enable gesture-based user interfaces"
STMicroelectronics is betting that MEMS gyros will find a mass market in sophisticated user interfaces that enable the recognition of complex human gestures using angular momentum sensors for pitch, roll and yaw. Smart phones, gaming controllers and gesture-recognizing remote controls using MEMS gyroscopes are due in stores by Christmas 2009. MEMS acccelerometers have already been designed into such consumer items as the iPhone, a PS3 controller model and Wii "nunchucks," where they respectively measure tilt for switching the display from portrait to landscape mode, enhance virtual steering and allow free-style motion sensing. MEMS gyroscopes will add angular momentum (pitch, roll and yaw) to enable the recognition of more-complex human gestures. 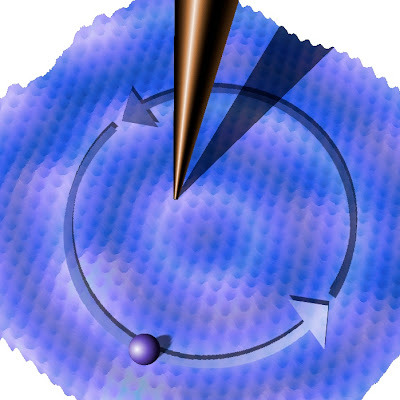 "QUANTUM: NIST demos mechanical quantum effect"
Most quantum phenomena are impossible to directly observe--such as the "spin" of an electron or the "polarization" of a photon--but now scientists have succeeded in transferring entangled spins to a mechanical oscillation--a nano-pendulum--thus opening the door to devices that feature quantum behaviors at the macroscopic level. Physicists at the National Institute of Standards and Technology have synchronized the motions of two nano-pendulums by virtue of a quantum phenomenon called entanglement— what Albert Einstein called "spooky action at a distance." 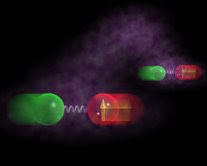 Quantum entanglement keeps atoms, electrons and photons in synchronized states no matter how far they are moved apart. Entanglement is to communications what "Beam me up Scotty" is to transportation — a kind of faster-than-light connection that instantaneously links entangled atoms regardless of distance. The NIST nano-pendulum consisted of two ions four microns apart—charged beryllium and magnesium atoms—oscillating in perfect synchronization with another spatially separated pair of entangled ions 240 microns away. 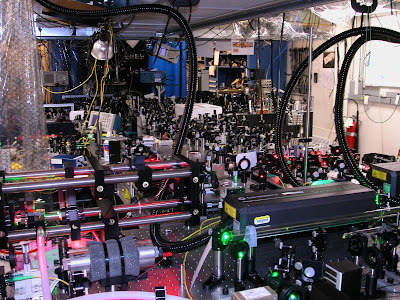 First they used pulsed lasers to cool the atoms in an electrostatic trap between two parallel facing electrodes. Then they used a pulsed laser to entangle the spin states of the two beryllium atoms, and another pulsed laser to transfer that spin state to the pendulum-like oscillation motion between the two ions. "ENERGY: Nanopatterning boosts efficiency of incandescent bulbs"
Optics researchers have learned how to use lasers to inscribe nanoscale patterns into the surface of metals, thereby changing their color without having to use filters that cut down on light. One etched pattern creates the ideal "black body" that radiates all wavelengths equally, which the researchers tried on a tungsten lightbulb filament, resulting in a significant boost in efficiency. Will high-efficiency incandescent bulbs make a comeback against emerging solid-state lighting? I give them 50/50 odds. R.C.J. 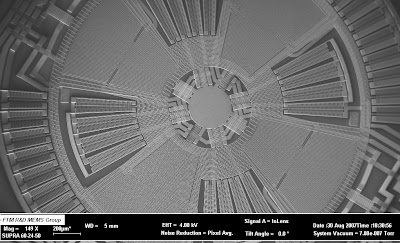 Using ultrafast lasers to inscribe nanoscale patterns on the filaments of standard incandescent lightbulbs, researchers at the University of Rochester (N.Y.) were able to increase the bulbs' light-emitting efficiency dramatically, letting a 60-watt bulb shine as brightly as one rated for 100 W. The nanoscale patterns make the tungsten lightbulb filament a "black body" that is much more efficient at radiating light. Now the team is working to tailor the color of incandescent bulb filaments, not only to boost their efficiency but also to enable their light emission spectrum to be customized for different applications. "MEMS: barometer chips boost hard drives, GPS"
Sensor markets are standing up to the recession, thanks to the pickup in design-ins for MEMS-based motion, elevation and proximity sensors. MEMS sensors are increasingly being integrated into phones, MP3 players, GPS units, mobile Internet devices (MIDs), portable medical scanners and all sorts of greentech products. The next must-have sensor is the MEMS barometer which enables hard drives to pack more bits, gives GPS units elevation readings, provides health monitoring as well as solves many environmental, safety and security sensing applications. So many OEMs are planning to use two MEMS chips--an accelerometer plus a barometer--that major semiconductor makers will begin selling integrated chips with both by 2010. R.C.J. First came MEMS accelerometers that sense when hard drives are being dropped and warn them to lock up their heads; now MEMS barometers are being pitched as a means to increase disk storage capacity. And the MEMS sensor count is rising in scores of products beyond hard drives. Freescale had already sold millions of MEMS accelerometers as airbag sensors in high-reliability automotive applications before it entered the consumer electronics market a few years ago with accelerometers for hard drives that can lock up their heads when dropped. Now the company is hawking a companion digital barometric pressure sensor that it says will let hard drive makers optimize head flying heights for maximum information density. The digital pressure sensor debuted today (June 2) at the Computex expo in Taipei, Taiwan.